A chilled out vibe and delectable cocktails..it ain’t all monkey business here! Quirky and bustling, Monkey Business bar is a favorite amongst locals and tourists alike. There are a bunch of bars in Cabo but what sets this one apart is the attentive staff and the refreshing concoctions that the bartenders whip up. This place serves legendary margaritas and also has an airy outdoor section. A great place to start your bar hopping in Cabo San Lucas or just spending an evening of people watching! Verify timings before you visit. Remians open till 1.00 am. Nearest bus stop: La Paz bus station. How popular is Monkey Business Bar? 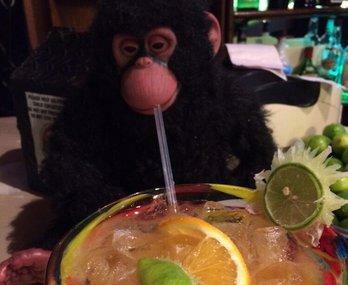 People normally club together Arte De Origen and El Squid Roe while planning their visit to Monkey Business Bar. What a great place! Hands down, the best fresh made margaritas I have ever had. Found this gem of a place 16 years ago and have been coming back ever since. The bartender Victor rememberers his guests from year to year and makes you feel right at home. Great guy and great service! Don’t forget to stop in the liquor store next door and Meet Rudy the owner of the complex. His prices are great and he usually has some open to taste. This place was a lot of fun! From the great - and huge - margaritas to the nostalgic music playing on the television to the entertaining staff! My only complaint is that we didn't discover it until our last day in Cabo! Best Margarita yet! Truly a hole in the wall, a little hard to find. But worth the looking around the corner for it. The back of the bar is on the sidewalk. There is no sign except the one above the bar. Only 10 chairs at bar, two or three tables for another ten. Walls totally absent so don't look for bricks and mortar, only umbrellas. Good hunting. Absolutely great place to go. Really friendly staff, fairly decent prices for how much you get. And they are *NOT* lighthanded when it comes to the alcohol. They take care of their people, and they actually remember you if you come back after a few days. We spent several nights of our trip here. Good pick! This by far is the BEST bar/drink in Cabo. Margarita is best value in town. I dont care for Margaritas and drank several without having to break the bank. Bartenders are friendly, PATIENT, and entertaining! Highly reccomend!